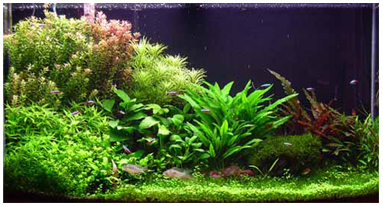 When a young aquarist, or anyone new to the hobby, begins to investigate how to keep aquatic plants successfully in an aquarium, that person can feel daunted by the science and cost involved. Do not fret! There are simple, hardy plants! I have found ferns and Anubias together create an intriguing display with little effort, special care or major investment. Water Ferns are perhaps the easiest of any aquatic plants to keep because they require minimum lighting standards, absorb most of their nutrients from the water, and can grow without adding supplemental CO 2 . I have found them to be able to tolerate a wide range of water conditions and temperatures. There is nothing plain about the willowy, delicate leaves, or the dark, rustic shapes of ferns. Reminiscent of the houseplant philodendron with its sturdy oval or elongated shaped leafs, the Anubias provides the needed contrast of strength when placed with ferns. Before I get into the details of a set-up using these plants, I will give a brief description of each plant. Java Fern, Microsorium , is perhaps the most well known and most recommended plant for low light level set ups. Because leaf stalks grow from a rhizome root that can be divided, and new plantlets also form from the older leaves, it is an easy plant to reproduce. Sometimes a layered effect is created with new plants growing on top of each other. The "Windelov" hybrid grows more quickly than other Java Ferns. Java Fern should be attached to wood or rock so that the roots can access nutrients direct from the water, not the "substrate" or gravel. Poor conditions can cause the older leaves to turn black and begin to decay, but even under these conditions, new baby plants will begin to come to life from the decaying leaves. Watersprite, Ceratopteris , is the most prolific water plant, growing very quickly under most any condition. The plant may be rooted directly into the substrate, but will grow as a floating plant, or attached to wood or rock. Cuttings are made from the elbows at the point the stem branches and where roots develop, or from the plant tops. Often mistaken for Water Sprite by retailers because of its similarity, Water Wisteria, a Hygrophila specie, is not considered a low light level plant and should be avoided in this set up. African Fern, Bolbitis heudelotii is an exotic looking fern with dark green deeply grooved leaves growing from a rhizome as Java Fern does and requires a bit stronger light. The main root can be divided to create additional plants. Anubias is a slow growing broad leaved plant with thick leathery green leaves from a rhizome. There are several varieties that vary somewhat in size or shape. Because of its slow growth, it can do well in set-ups that have a limited amount of CO 2 available, but it does need a rich source of chelated iron, macro nutrients, and trace elements. Requiring only a low to moderate light level, it will grow faster with stronger light, if CO 2 and additional fertilizer are also increased. There are various supplements that are made for the aquarium substrate that provide iron, (such as laterite, a tropical clay), or supplements that can be added to the aquarium water. Red clay, or clay enriched subsoil can be used in small amounts, (about a one inch layer in the middle of the substrate). Anubias roots will attach to nearby rocks or wood, but I prefer to plant it into the substrate to draw nutrients. The rhizome should be left uncovered to prevent it from rotting in the substrate. I do like planting small Anubias species, such as Anubias nana , directly to wood when creating a layered, terracing effect. The bottom substrate consists of two inches of sand mixed with Fluorite and a one inch layer of Fluorite partially blended with sand on top. Four large Watersprite plants surround a centerpiece of red curio wood that is covered with small Java Ferns and African Bolbitis . In the foreground are two small anubias plants reaching toward the wood pile creating dark shadows under their leaves. The Watersprites create a yellow green backdrop against the dark green Java and African ferns. I have Cherry Barbs and White Cloud Minnows as cohabitants. Experiment with the placement of the plants and wood, bearing in mind the contrast in color between the Watersprite and the other plants, and because the Watersprite will grow much faster than any of the other plants, it would be more suitable in the background or to the side. Spacing, color and contrast add depth and a three-dimensional look to your display. Adding height and depth to the perspective view is easy by stacking wood piles and attaching the plants to the various levels. Light intensity is measured in "lumens", however I like to follow a simple guideline that many people have used for a long time: the watts per gallon rule. A low light range is considered 1.5 to 2 watts of standard fluorescent light per gallon of water. For the plants that I have described, I would recommend 2 watts per gallon. A fluorescent with a "Kelvin" rating of 5000 to 6500 is preferable in my opinion. Lights should be run for not less than 10 hours a day and not more than 12 hours a day in order for the plants to go through their proper photosynthesis. Fluorescent strip light fixtures, shop light fixtures, or cabinet shelving fixtures can all be used with the proper Kelvin type of bulbs. With ferns the substrate material is less important because the plant will take most if not all of its nutrients directly from the water. I have found Anubias to do better with a source of iron in the substrate. There are many sources on the internet and in books and magazines for building a proper fortified substrate for plants. Natural or clay gravel provides a rich earthy brown color that is less stressful to the fish than a light colored gravel or sand. A beautiful aquascape can be created using a combination of various types of wood, such as bogwood, driftwood, and curio wood. Corkbark weighted down has a very unusual look and is an excellent surface for roots to adhere to. I have found these plants to be very tolerant of either hard or soft water and temperatures from very cool to very warm in the summer months. If you are not adding supplemental CO 2 , ideally the water should be soft with a pH of neutral or lower. The ideal temperature is between 72 and 78 degrees F. Soft, neutral water will retain more of the natural CO 2 , but if adding CO 2 , alkaline hard water can hold more added dissolved CO 2 . I have much larger, and more complicated planted tanks, but this remains one of my most favorite tanks to sit quietly in front of: taking in the simple, but graceful beauty. It is truly relaxing.